Dr. Lawrence Supporting Fashion Moving Youth Forward in D.C. The Southeast Tennis and Learning Center, through its 7th Annual Sew N’ Know Fashion Show, invites Dr. Clayton Lawrence to share his passion for fashion to inspire area youth. Washington, DC, June 10, 2014 --(PR.com)-- LEAP Foundation DC, led by Chairman Dr. Clayton G. Lawrence, has been actively supporting the Southeast Tennis and Learning Center (SETLC) through the Recreation Wish List Committee (RWCL) since 2013. Both organizations harness the power of youth activities to encourage young people to stay in school, attend college, and pursue their dreams. One of several academic enrichment programs that the SETLC offers to its youth participants is the entrepreneurial fashion program, Sew N Know, which teaches students the skills associated with fashion design, along with the business skills needed to market and manage their creations. 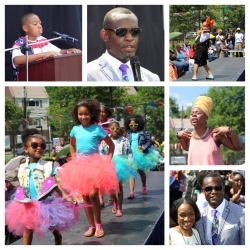 Dr. Lawrence, with an affinity for the arts and true passion for fashion, was the guest speaker at Sew N Know’s 7th Annual Fashion Show that took place on Saturday, June 7th. Dr. Lawrence and his non-profit organization, LEAP Foundation DC, know all about working to help students set goals and stay on the path towards success. Coming from humble means himself, Dr. Lawrence was taught the importance of education at a very early age, and that, along with his interest in fashion and his entrance into the world of modeling in the mid 90’s, have culminated into a variety of opportunities and successes in his personal and professional life. At the end of 2013, Lawrence released an autobiographical account of his life called The Sum of My Success, which details his roles as a doctor, executive, athlete, and model, and how each of these roles come together to fulfill each of his lifelong dreams and passions.